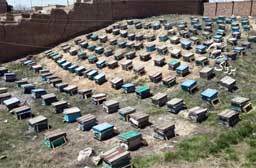 BAMYAN (Pajhwok Afghan News) – After marking increase in high-quality honey production in central provinces of Afghanistan, producers urge upon government to help find international market for their products to further promote the honey-bee business. They claim they produce over 15 tonnes of quality honey annually. Farm owners say the best honey comes from thorn flowers which is plenty in Behsud district of Maidan Wardak, Panjab, Wers and Yakawlang districts of Bamyan and other disrtricts in Ghor and Daikundi provinces. Mohammad Amin Zaman, a farm owner in Maidan Wardak province, told Pajhwok Afghan News he started honey farming eight years back and was managing four farms in these four provinces now. In the beginning, he said, honey production reached up to dozens of kilogrammes, while now it reaches up to 15 tonnes. He was also selling bee boxes to those who were interested in honey-raising. Zaman said their products were being exported to Kabul, Kandahar and Balkh provinces and they wanted the government to help them in technicalities as well as finding international market. Mohammad Ali Nekzad, who owns a small store in Bamyan and sells Koh-i-Baba honey, said their sales were less due to high prices. “This honey is pure, but some people cannot afford to buy it”, he added, saying those who knew good honey was ready to buy these products in any price because of its quality. Mohammad Nabi, a professional beekeeper, said they also gave two-week training to those who were buying some farms. He added that during the winters they shifted their bee boxes to the tropical areas to reduce the number of fatalities. Mohammad Tahir Ataee, agriculture department director, said only in Kahmard district honey-bee farms and unions existed, while in other districts honey was produced on individual basis.